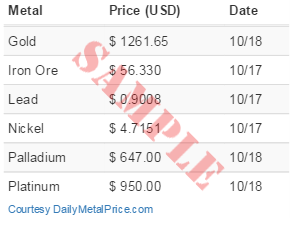 Daily Metal Price: Copper price (lb) for the most recent month. Use this form to dynamically generate a table that show metal prices in the units of your choice for the duration specified. Simply select a metal and a unit to display the price. Lastly choose the number of days to show in your table. Tables and rates are based on our daily price updates. A futures contract is an obligation to buy or sell a commodity at a specified date and price, while an options contract grants the right, but not the obligation, to buy or sell at an agreed upon price. While participants in futures markets risk paying too much or selling for too little, options may simply expire worthless. Market participants may minimize the effect of volatile prices by hedging. Hedging is the practice of offsetting risk, often by purchasing one position to protect another position. 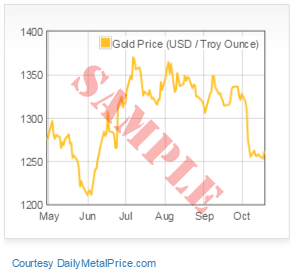 For example, many investors recommend gold as an investment to protect against a falling US dollar and vice versa. Many investors recommend gold as an investment to protect against a falling US dollar. Because of this, gold will usually rise when the US dollar falls and vice-versa.